LOCKHART, TX. — How many homes can claim their own freeway exit? Briarpatch Ranch, located just north of Lockhart on Texas 130, can. This weekend — and then again in two weeks — the eclectic ranch complex built by the late Dollie Ann Fechner Cole and her family will turn once again into a giant estate sale. Two sales have already taken place, but innumerable items remain. Now, don’t visualize overpriced antiques and heirloom paintings. Cole, who died in August 2014, just loved buying. Often, in bulk. Sometimes at estate sales, like this one at her stone ranch house and nearby barns; sometimes at Kmart. On sale are tens of thousands of items, some high-end, many others bargain-basement. Pieces of apparel alone numbered more than 5,000, guesses her daughter, Anne Cole Pierce, who oversees the bazaar. Well beyond Dollies’ closets, there were many interesting items on her ranch and in her garage……………about twenty Chicago Yellow Cab Checkers! Who was Dollie and how did she amass a fleet of Chicago Checkers? Mrs. Cole, widow of the late Edward N. Cole, former President of General Motors Corporation, was a respected businesswoman, serving in leadership roles on numerous national and local boards including on the board of PBS, Project HOPE (World Health Organization), The Smithsonian National Air & Space Museum, the National Corvette Museum, HPSC, a national leasing and finance company based in Boston, National Captioning Institute for the Hearing Impaired, National Academy of Sciences Presidents’ Circle, and the 100 Club of Central Texas, a charitable organization established to support the families of officers killed while serving the public. 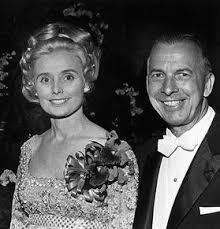 Mrs. Cole was also a member of the Corvair Society and was a Distinguished Woman of Northwood University. Ed Cole was the former general manager of the Chevrolet Motor Division and president of General Motors. In the early 50’s, Cole was the lead engineer in charge of the development of a new Chevy engine built to replace the Stove Bolt Six; this new engine was Chevrolet’s small block V8, a massive success that remained in production into the twenty first century. Partnered with NYC Cadillac dealer Victor Potamkin, Ed Cole made a substantial investment with Checker Motors Corporation. Cole and Potamkin took a majority stake in CMC’s taxicab division. This new partnership with Checker presented the magic formula of Potamkin’s deep financial pockets aligned with Cole’s automotive engineering capabilities and GM connections were the perfect combination required to transform Checker for the future. It was an exciting time at Checker! Expectations were high that the new partners would revitalize Checker’s future, new models would be introduced and the company would grow. The expectations was that Cole would develop a new Checker Taxicab. The hoopla was significant; the US automotive world was watching Checker when tragedy struck. Just weeks into the new partnership, Ed Cole was killed in a plane crash while flying his private plane to Kalamazoo just three months after joining Checker. The automotive dreams of a CMC transformation died with Cole that day. After Cole’s death, Potamkin would remain and Cole’s widow Dollie would take a role in protecting her late husband’s interest in the taxi division. The roles for Dollie was a leadership position within the Taxicab unit. The titles for the majority of the Chicago Yellow Cab fleet had one name as the titleholder, that name was Dollie Cole. Ultimately Potamkin and Dollie Cole would be bought out of the CMC business unit and exit. That said, it appears that when Dollie left she took some Checkers with her! Within the inventory of the Dollie Cole fleet were about 20 plus Yellow Checkers. 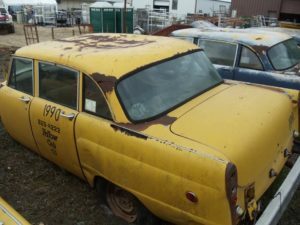 Being the buying crazy collector depicted in the Dayton Daily Times, it appears that Dollie loved Checker so much, she move a fleet of ramshackled, beat used Checker taxicabs. 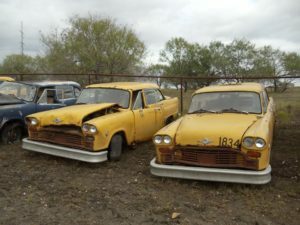 Assuming that she moved them to Texas at the time she left Checker, it would appear that these parked units sat for close to 35 years. 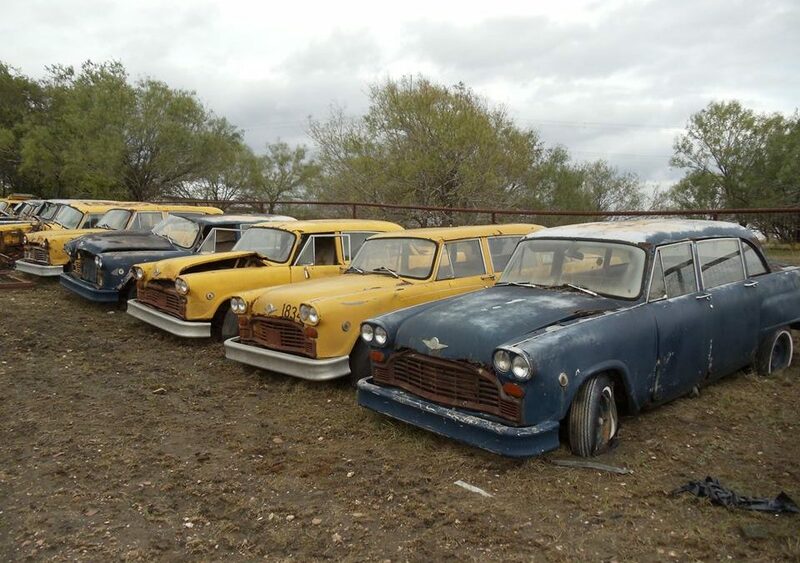 Unfortunately time, weather and rodents did not improve the general condition of these cars. 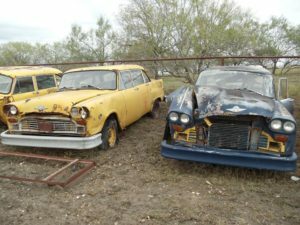 At the time of the estate auction, not a single car was sold. The prices expectations of the estate firm far exceeded their value, so none were sold. In 2016 the cole real estate was put on the market and sold, at the time of the sale, the Checkers were gone. 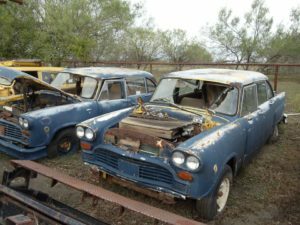 It’s not clear what happened to the cars, but given we have not seen any turn up for sale post auction, it’s safe to assume that the cars were crushed. P.S. Mom would have loved your article. Take care. Please keep us posted, thanks to hear that the Checkers are still available!